The company received the accreditation following an in-depth audit process under the jurisdiction of KNPC Committee Members Mr. Bandar M Al-Qahtani and Mr. Saleh Al Antere. This involved inspection and assessment of all the tube manufacturing facilities and processes to ensure everything met with the standard as outlined by KNPC.Sandvik’s Middle East & North Africa (MENA) team saw the value of going for KNPC accreditation and initiated the idea, working with the Sandvik team in India. Receiving this recognition will provide several benefits for customers and Sandvik within the region. OVAKO says visitors to Subcon 2017, the UK’s subcontract manufacturing supply chain show dedicated to outsourced engineering services, now in its 41st year, can take part in special interactive demonstrations of its Steel Navigator. The powerful digital platform allows customers to search and find the most suitable steel for their applications. 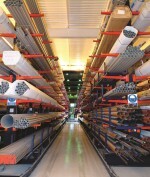 SANDVIK says a stock of more than 16,000 standard stainless steel items at its distribution centre in Halesowen, West Midlands, help service on-demand and scheduled supply requirements for stainless steel and advanced alloy materials to customers throughout the UK and worldwide.